The state of the atmosphere with respect to wind, temperature, cloudiness, moisture, pressure, etc. Weather refers to these conditions at a given point in time (e.g., today's high temperature). The wind moves the clouds. The faster the wind is moving, the faster the clouds move. There are three main types of clouds - cirrus, cumulus, and stratus. The four types of precipitation are rain, sleet, snow, and hail. Depending on the temperature of the air, precipitation may fall as a liquid or as a solid. What are the types of fronts? Warm, cold, stationary, and occluded are the types of fronts. Fronts form when large masses of warm and cold air meet. Weather often changes as the front passes through, depending on the type of front. What is dew? How did it get there? Because of daylight heating, it is generally warmer during the day than it is at night. During the day when it's warm, water evaporates into the air and the amount of water the air can hold depends on how warm the temperature is. At night as the temperature cools down, the moisture that evaporated during the day is still in the air, but the air is no longer warm enough to be able to hold as much moisture as it could during the warmer day. As a result, the water begins to condense on the cooling ground. In other words it comes out of the air forming dew. When the temperature warms up again in the morning the air can contain the water again and the water evaporates back into the air. What are the different forms of heat transfer? The different forms of heat transfer are radiation, conduction, and convection. Thunder is caused by lightning, which is essentially an electrical current flowing between or within clouds, or between a cloud and the ground. The air surrounding the electron stream is heated to as hot as 50,000 degrees Farhenheit, which is three times hotter than the surface of the sun. As the superheated air cools it produces a resonating tube of partial vacuum surrounding the lightning's path. The nearby air rapidly expands and contracts. Currently, tornadoes are classified using the Enhanced Fujita Scale. The scale classifies tornadoes based on the type and severity of damage the tornado produces. Because of their short lives and violent winds, tornadoes are difficult to study when they are on the ground. Because of this, scientists have to study the damage left behind. How often do tornadoes strike? Georgia’s average number of tornadoes in a year is 6. Can a tornado destroy a whole city? The largest width recorded for a tornado was 2.6 miles. While this would definitely damage or even destroy a small town, it would not destroy a large metropolitan city. Unlike tornadoes, exact, immediate data about the hurricane can be gathered and monitored. The scale used to classify hurricanes is referred to as the Saffir-Simpson Scale. This scale focuses on the intensity, especially wind speed. The information also alerts residents on the possibility of a strong storm surge. Which is the most dangerous - tornadoes or hurricanes? Why? Both weather phenomena are dangerous. Tornadoes occur very suddenly. Deaths usually occur because people had no idea that the tornado has touched down and is heading their way. Advances in technology have increased the amount of time to proceed to safety. The average time for people to take shelter, also known as lead time, is 13 to 14 minutes. This is almost three times as long as the lead time in the 1980’s, which was about 5 minutes. In 2011, there was a tornado outbreak, with a total of 358 tornadoes in the span of 4 days (April 25-28). The number of fatalities exceeded 550. At least four EF5’s were identified from the tornado outbreak. The outbreak caused approximately $11 billion dollars. In 2005, Hurricane Katrina moved into the Gulf of Mexico. From August 23 to August 31, Katrina grew into a Category 5 hurricane with 170 mph winds, and then made landfall as a Category 3, with 125 mph. The death toll was over 1300, mainly due to the storm surge. Damage exceeded $81 billion dollars. GOES time-lapse animation of Hurricane Katrina Mississippi on Aug. 29, 2005. What is the difference between a severe weather watch and a severe weather warning? A severe weather watch, or any other watch, indicates the atmospheric conditions are present for the severe weather to occur. People in the area should be aware of the conditions, and plan accordingly. A severe weather warning, or any other warning, indicates the the severe weather is occurring at the present time. People in the area should immediately take shelter and listen for updates. What are all the lines on a weather map? There are several types of lines found on a weather map. An isotherm is a line on a map connecting points having the same temperature at a given time or on average over a given period. An isobar is a line on a map connecting points having the same atmospheric pressure at a given time or on average over a given period. Why is there a H or a L on a weather map? What does it mean? The letters are the symbols for the different types of pressure systems found in an area. H designates a high pressure area, whereas the L represents a low pressure area. An anemometer is an instrument that measures wind speed. 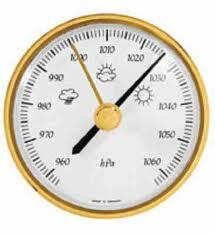 A barometer is an instrument for determining the pressure of the atmosphere. What does a psychrometer do? A psychrometer is used to measure humidity. It has two bulbs in order to function properly - one is wet and the other is dry. The temperature differences between the two are noted to determine current humidity conditions. What does a wind vane do? A wind vane identifies the direction the wind is moving. Climate refers to the "average" weather conditions for an area over a long period of time (e.g., the average high temperature for today's date). Seasons occur on the Earth because of the tilt of the Earth's axis, which is tilted approximately 23.5 degrees. Because the Earth's spin is not exactly aligned with the Earth's orbit around the sun, the Sun sometimes shines directly over the northern hemisphere, and other times shines directly over the southern hemisphere. For instance, the sun reaches its most northerly position (the tropic of cancer) on June 21. This day is called the "summer solstice." If you were standing on the tropic of cancer on this day, the sun would be directly overhead at noon. June 21 is the first day of summer in the northern hemisphere, and the first day of winter in the southern hemisphere. Because the sun is shining more directly in the north than in the south, the weather is warmer in the north in June. In December, the opposite happens. The sun is over the tropic of Capricorn, and is shining directly at the southern hemisphere. With less direct sunlight in the northern hemisphere, the temperature drops, bringing fall and winter. So December is summer in Australia and Brazil, but winter in America, Europe, and Asia. What provides the energy for weather? The Sun is the source of the energy in weather. A drought is a prolonged period of abnormally low precipitation which leads to a shortage of water. How long has Georgia had a drought? The most recent “severe” drought period in Georgia began in September 2010 following a summer of only 70% of normal rainfall over 2 months. However, in late spring 2013, the “severe” drought designation was lifted for the majority of Georgia after a state average of almost 10 inches of rainfall. What does it mean when someone says that it is “muggy”? “Muggy” usually refers to an unpleasantly warm and humid atmosphere. The word derived from the Scandinavian word “mugga” mist, which means “to drizzle”. My grandparents’ joints ache when a storm is coming. Why? When storms are rolling in, barometric pressure decreases. This drop affects sensory nerves in joints, commonly hips, knees, elbows, shoulders and hands. The nerves react with an aching sensation as the barometric pressure fluctuates. Despite popular misconceptions, the sky is not blue due to the reflection from the oceans. The blue color of the sky is actually due to light traveling through the sky. Much like a prism, the molecules of the sky bend or stop some colors of the light spectrum. However, the “blue” light travels through, making the sky blue.